The Audio Processor Silver 4B-mini FM offers the user input selection between analog and digital. The audio is then routed through optional pre-emphasis filters. The Audio Processor Silver 4B-mini FM offers bass enhancement via a peaking filter that can be set to provide up to 6 dB of gain on one of four frequencies with a choice of 4 Q’s. The Audio Processor Silver 4B-mini FM processes each band with RMS based levelers. Each band, gain control, and processing function can be configured in different manners to provide different effects. Adjustable timing constants, drive and silence gating afford the user full control of this important stage of the processor. Each band has its own dynamic peak limiter. Multiple time constant based detectors are adjustable as well as input drive levels. The Audio Processor Silver 4B-mini FM includes a 4 band equalizer. It allows you to subtly color your sound after the Multi Band Limiter stage, and before the audio goes into the peak processing path. The Audio Processor Silver 4B-mini FM peak limits (clips) and linear phase filters the low frequencies before these are fed to the final clipper stages. The stereo encoder is highly over-sampled and offers superb stereo performance. A composite clipping function is provided for those who wish to use it. 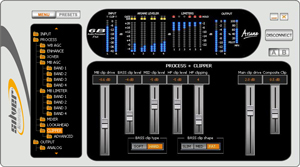 PC software enables easy local or remote configuration of the Audio Processor Silver. Connection is made through RS232 (serial or USB port) or via TCP/IP. All parameters can be configured with the user friendly interface and the results are displayed on the LED meters, on the front panel and on the configuration screen of the software. Output Level (100% peak modulation) Software adjustable from –12 dBu to +24 dBu peak, into 600 Ohm or greater load.